Hong Kong’s umbrella revolution on September 30, 2014. Pasu Au Yeung/ Flickr.Some rights reserved.The most recent protests in Hong Kong are indicative of a trend among people’s movements that use civil resistance – the increased emphasis placed on the taking and holding of physical space, which is to say, the tactic of occupation. Usually focused on a central square, as in the case of Egypt and Ukraine, or concentrated on a particular site emblematic of injustice, as in Occupy Wall Street, occupations as a tactic have been a media coverage-igniting feature of many of the most important protest campaigns occurring over the past few years. This stands out as a relatively new phenomenon when considered within the longer history of civil resistance movements, when the tactic or place of occupation seldom came to define the entire movement. Recent occupations appear to be defined by their openness, accessibility, and public visibility. This seems to be what makes them both robust but also vulnerable. This element allows them either to be magnets for participation both by ordinary civilians and those associated with the regime or other opponents who defect -- or when repression occurs, the public symbol of a real or perceived loss of momentum. Occupied sites create a public theater for resistance, a focal point for the praise and global solidarity that comes via international media coverage, while also being subject to its whims, superficial attention span, lack of knowledge of the dynamics of civil resistance, and attraction to violence. Overall they represent something of a precarious, high-stakes game that organizers for now believe may be a winning approach. In the same way that the term “color revolutions” was used by opponents of nonviolent movements to define successful and unsuccessful attempts at overturning authoritarian governments, the global media are now eager to cover occupations. So does this mean we are entering the era of Occupy? What are the advantages and disadvantages of elevating this tactic (or allowing this tactic to be elevated)? And how might movements “occupy” more effectively? Like the term “color revolution” promoted by Vladimir Putin as a means to suggest that all of these movements were being fomented by outside forces, “occupy” or “occupation” could be recast as a pejorative term intended to pigeonhole and belittle movements. It could be argued that the so-called color revolutions in Serbia, Georgia, Lebanon and Iran, and particularly the electoral revolutions in post-communist Europe, unearthed a new approach to civil resistance that was effective, because it found a way to channel conventional political participation into nonviolent action at the right moment. During many of these electoral revolutions the critical movement-building phase occurred during and alongside the conventional campaigning process, as student-led groups like Serbia’s OTPOR, Georgia’s KMARA, and Ukraine’s PORA worked as a para-political force, spreading the movements’ strategies, rallying populations around the political candidates representing change, while also giving the general public an alternative means of participation if/when the elections were compromised. This worked as if it was a nonviolent insurance policy for elections, and because it was a legible and replicable type of strategy, it became transferable to other societies. The same could be occurring today with “Occupy,” whose pioneers, particularly in Egypt, discovered that new technology, especially in social media, in some cases enabled movements to achieve significant momentum relatively quickly. This momentum was then directed at a central point within a city, often chosen for its symbolic connection to principled grievances, and gave easy access and strategic importance to a core location. If the mass can sustain itself long enough, the center of occupation doubles as a catalyst/ venue for subsequent protests and participation, and if momentum increases, the movement is able to expand outward from the center, provide cover to security force defections, and impose economic costs on the government. The core of this is simple enough: the movement must establish and protect its nucleus and keep it open to additional participation so that it may expand and grow. But it starts to get tricky when one realizes that all of this is predicated on a movement’s ability to take and hold physical space. Because these occupations are nonviolent, even the most brutal regimes often begin by deploying ‘non-lethal’ means of dispersing protesters before they become more repressive. But almost all non-democratic governing authorities seldom refrain from using lethal force once non-lethal means have reached the limits of their effectiveness. This was true in Bahrain, when the government not only decided to fire on the nonviolent protestors occupying Pearl Square, it robbed the movement of its symbolic gravitas by destroying the square itself. Additionally through the use of agent provocateurs and/ or hired thugs, security forces have often proved to be quite adept at provoking violence, or at least creating the perception of violence, and then using this to justify lethal force. We have consistently seen these counter-occupation tactics work for a period of time, or work to bring an end to protests, in nearly every movement that has experienced repression. Occupation-based movements seem to be particularly vulnerable to such provocations, incursions, and infiltrations, given the fact that the operational consequences of much of a movement’s strategizing happens out in the open, but also because occupations need to defend such space so it can be open to more participation. On top of all this, when any violence does occur, regardless of whether it is due to a breakdown in nonviolent discipline, regime provocations, and/ or radical flanks, it will almost always become the focal point of mainstream media coverage and potentially scare off potential participants and reduce the chance for defections. What occupations give, misdirected occupations can take away. This seemed to be true in Ukraine. Upon arriving in the Maidan in Kyiv last winter, just in time for the New Year’s celebrations, I was amazed by what had been achieved in only a matter of weeks. The space, both physical and political, that had been created and protected by the barricades and the occupied buildings contained a kind of micro-society that was an embodiment of the values that people from all across Ukraine sought to instill in a freer society. Everyone from the Euro-focused youth groups to the rightist Svoboda party engaged in all forms of political action and speech, on equal ground, in a civil environment, free from harassment, intimidation and fear. There were live lectures given by volunteer professors, perpetual stump-speaking, political theater, and pamphleteering. It had the feel of an art exhibition/ rock concert/winter barbecue. There was a no-alcohol policy enforced by volunteers, who also manned a series of small narrow entrances and exits to keep out thugs and hooligans and provide safe passage to students, intellectuals, workers, parents, grandparents, and their children. Quite contrary to the narrative peddled by the mainstream international media, I learned that the occupation of the Maidan began not as a pro-EU demonstration, but as a reaction to the regime’s harsh repression of a pro-EU student protest, and it was the forceful denial of the students’ right to free speech, not the desire to join the EU, that turned the Maidan from a protest into a national movement. Thus the creation of a space protecting free speech and assembly was visually defined by the use of civil resistance. This space was also well-managed and defended, although an informed observer might have had qualms about the mainstream opposition political parties who seemed intent on stealing the show with impressive stage lights and sound systems afforded to them by party budgets. The organizers were mostly volunteers from a smattering of local civil society groups, and having successfully created the nucleus, which at that time had swelled to envelop a number of key government buildings, they sought to maintain its growth. Shortly after I left Kyiv in mid-January, the Yanukovych government’s security forces launched a sustained offensive against the protesters, attempting to once again retake the square. Given the importance of protecting the movement’s nucleus, protesters were forced to defend the square by all means short of outright violence. Such security force tactics imposed on the movement the strategically ambivalent task of restricting themselves to what they could believe was an acceptable level of violence. From that point forward it seemed that the immediate fate of the struggle was resting on the dilemma of whether taking the necessary steps to defend the square - such as being armed with clubs and makeshift armor, launching stones and even Molotov cocktails at police, and burning tires and police vehicles - would lead to greater and more violent repression, more deaths, and fewer security force defections. In the long run, showy violence by some protesters did enable Yanukovych and later Putin to claim that the Maidan had been a violent revolt. But it’s likely that because the movement had been nonviolent for so many weeks, this did not compromise popular support. The choice to defend the square did lead to more intense repression, but it was maintained long enough to help invite key defections within the security forces, which were enough to send Yanukovych running and kick-start the process of creating a new government. Had Ukrainians by hook or crook gotten it right and found thematic balance in an occupation: just the right amount of force necessary to defend the core, but not enough to alienate the base and potential defectors? If so, then we should ask if this is what it takes to leverage success via occupation-based tactics. Before the regime’s attacks started, the Maidan organizers maintained a peaceful civic environment, but the majority of people dispersed once the tear gas canisters, bullets, and stones started flying. This meant that the security forces had put an end to the most important features of the movement simply by attacking the perimeter of the space. We can recall similar scenes in Tahrir Square in Egypt during the early days of that enormous demonstration, when the square was staunchly defended by protesters throwing stones and other projectiles, and many died by way of police sniper bullets. The protests in Hong Kong seemed to be a product of a simpler, less confrontational occupation-based strategy, relying on makeshift barricades put in place to protect the core space where most of the nonviolent action took form. Still, the city government capitalized on this by accusing the movement of obstructing normal life, commerce, and preventing people from going to work and even getting to the hospital. Several episodes showed that protestors were also divided on issues related to the taking and holding of physical space, the construction and deconstruction of barricades, and decisions related to blocking buildings, roads, and whether or not to cut off the island in its entirety. When the protest began to wane, the government left in place barricades previously constructed by the protestors so that they could continue to make the claim that the movement was subverting society. 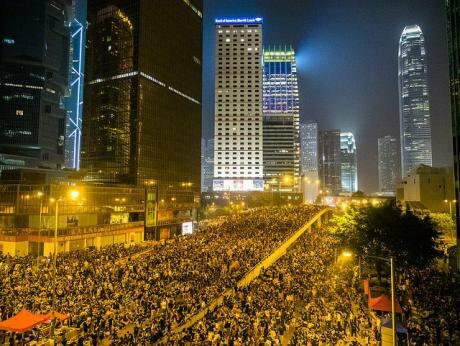 However the protesters in Hong Kong appeared to make some important innovations in their occupation, like countering regime accusations by opening certain barricades and allowing people to go to work. As in Ukraine they did not fall into the trap – as happened in Occupy Wall Street -- of allowing their nucleus to take on the appearance of a poorly managed protest camp, attracting hangers-on, and making everyday citizens skeptical about the movement’s seriousness. Yet something about the Hong Kong movement’s language also seemed to stick. In addition to the tactics and the term itself, new phrases such as ‘the 99%’ and the ‘one percent’ entered the lexicon and stuck around, becoming new frames for understanding the movement’s grievances. However something about the terms ‘occupy’ and ‘occupation’ seemed to evoke a sense of militant transience, a sense that the movement was commandeering a space that did not innately belong to them in the first place. Because the term ‘occupation’ does not connote ownership, of a space or of the larger society that it represents, it may serve to delegitimize movements symbolically by casting participants as “occupiers” – as if they were short-term guests instead of representatives communicating grievances held by a wider society within a public forum that is, or should be, legitimately open to their speech and presence. Occupation tactics akin to what we have seen in Ukraine, Egypt, Hong Kong, and various Occupy movements in North America and Europe, have also been used successfully in the past by other movements. Given the importance of broad, diverse, and sustained participation, it remains to be seen whether movements have been doing themselves a favor or a disservice by allowing themselves to be defined by the site of occupation or by the tactic itself, and not by political and social claims on behalf of those whom they represent.